Fights occur in Jacksonville Beach FL just like anywhere else. It is a not a normal occurrence, but as a Jacksonville criminal lawyer, I have had Jacksonville battery cases that have come from the beaches area. People are sometimes arrested for bar fights. The charge is usually Jacksonville fighting and affray. I have had Jacksonville driving under the influence cases from Ponte Vedra to Atlantic Beach Florida. 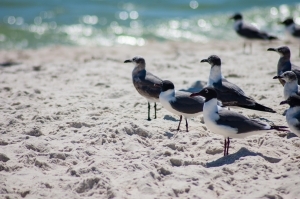 I have represented people charged with Jacksonville theft or burglary that were arrested at the beach. I have had clients charged Jacksonville juvenile crimes in the beaches’ towns. Crime occurs in every neighborhood. Certainly, it occurs in some neighborhoods more than others. In Duval County, the high crime areas are mainly on the north side of the Jacksonville. There are a few exceptions. As a Jacksonville attorney that has practiced criminal defense for years, I search for new crimes in the area to read about. I will write about local news on this criminal lawyers website and on the 20 Miles Law Jacksonville lawyers website. A small amount of my articles comes from stories about Atlantic Beach, Neptune Beach, or Jax Beach FL. I would not consider Jacksonville Beach a high crime area, but it does appear that things are changing for the worse. I have been seeing more stories coming out of the area. One of the biggest news stories that I have heard about beach crime happened yesterday on Memorial Day. “It’s going to take police some time to sort out everyone involved in a big fight in Jacksonville Beach on Memorial Day. Police from Neptune Beach, Atlantic Beach, and the city of Jacksonville assisted Jax Beach police in shutting down streets to avoid retaliatory attacks. This reminds me of the 4th of July in Jacksonville Beach in 2011. I remember riding my bike in the late afternoon on First Street. I was just south of Beach Blvd. I began to feel very unsafe due to people’s actions in the crowd. I immediately went home. I was not surprised to see that the 4th of July fireworks’ display was canceled for 2012. First Coast News reported that the fireworks were cancelled due to the budget, because spectators were basically trashing the beaches. The city could not afford to clean up after it. The Fourth of July fireworks will return to Jacksonville Beach this year. The City Counsel voted to do so. After the Memorial Day brawl that occurred, I would be shocked if the City Counsel did not have a meeting about the 4th of July. You do not need to be a Jacksonville criminal lawyer to know that you are either going to need a major increase in security or take away something that will attract numerous people and the same crowd that descended on Jax Beach this past Memorial Day.